The Buyer: Mr. Randy Edge always knew he would become a business owner, however, he was determined to do it right. Part of doing it right was to prepare himself to be an entrepreneur by developing a very thorough and diversified background and skillset. 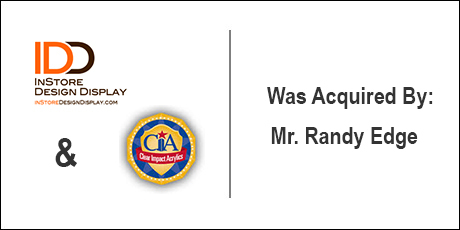 Randy started his career as an aeronautical engineer to gain technical expertise, then transitioned to an extensive stint of consulting for E&Y to learn about all different types of businesses, and then finally rounded out his skill set learning finance as a CEO of a community bank, all while being a long-term member of YPO. Once he had become a Purple Squirrel himself, Randy hired DVS to help him find a Purple Squirrel acquisition in Kansas City or Colorado that would allow him to fully utilize his varied expertise. The DVS search process sourced over 80 proprietary opportunities in three states for Randy, which culminated in the acquisition of InStore Design & Display as well as Clear Impact Acrylics. The Seller: InStore Design & Display has been in service for nearly 100 years in the Kansas City area providing expertise and design to the retail fixture market. Eventually, the ownership group of IDD helped start Clear Impact Acrylics with an industry manufacturing expert to deliver more creative and dependable solutions for their customers. The companies were intertwined in creativity, success, customers and history, but had different ownership structures and needed a well –rounded owner to finally bring them together and capture their true growth and operations potential. The Close: This deal involved an ownership group of six individuals with partial overlapping individual ownership in two different companies, as well as multiple operating sites with only one owned real estate location. The final transaction included SBA and Conventional loans, creative management structuring, a great management transition, and a consolidation of entities.